In a piece called The Beauty of Urban Planning from Space, the Sustainable Cities Collective highlights views from space of uniquely designed street pattern designs in various cities around the world. There are ten examples that illustrate the zenith of urban planning. As attractive as the street patterns are, they highlight the inevitable inability of designers, or anyone else for that matter, to influence much more than small changes in the overall urban form. This point is evident in eight of the 10 urban areas illustrated, where the unique street pattern comprise only part of a much bigger city. The eight are Belo Horizonte, Brazil; Brasilia, Brazil, Washington, DC; New Haven, CT; La Plata, Argentina; Jaipur, India; Adelaide, Australia; and Canberra, Australia. The best known example may be Washington, DC, where L'Enfant's street pattern served most of the city for more than a century, which is probably a world record for a growing urban area. Yet, today, L'Enfant's design covers less than five percent of the urban area that today has more people than the nation at the time L'Enfant received his position. 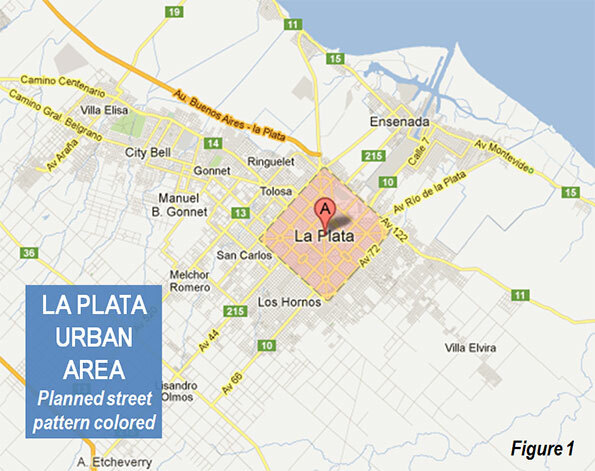 In La Plata (See end note on La Plata) the street design comes the closest to covering the whole urban area (Figure 1, from Google Maps). Taking design a bit further, every street is numbered in this city that was planned to be the capital of Argentina's largest province (Buenos Aires, which is separate from the provincial equivalent city of Buenos Aires). Three other of the examples were also new cities planned as capitals, including Brasilia, Canberra and, of course, Washington. The other two examples are a dying mining town (El Salvador, Chile), which has lost more than two thirds of its population and an Italian medieval fortress town, Palmanova. The latter is more a museum than a dynamic urban area. It is confined to its original area and its population could fit into London's Royal Albert Hall (approximately 5,000). The Belo Horizonte Centro (Note on Belo Horizonte) street pattern is unique. It was part of the inspiration for my Urban Tours by Rental Car website (rentalcartours.net) and a map of Centro was incorporated into the logo (Figure 2). In Centro, diagonals are superimposed on a conventional north-south/east-west street pattern (Figure 3, from Google Earth). 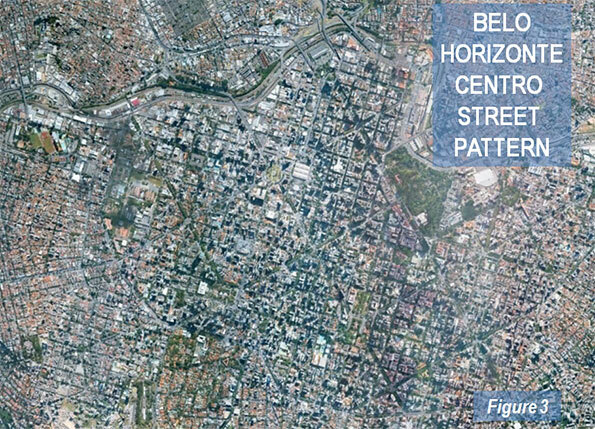 However Centro's street pattern covers less than one percent of the Belo Horizonte urban area, three square miles out of more than 400 (five square kilometers out of 650). Figure 4 shows Centro in red, engulfed by the much larger urban area, outlined in yellow. 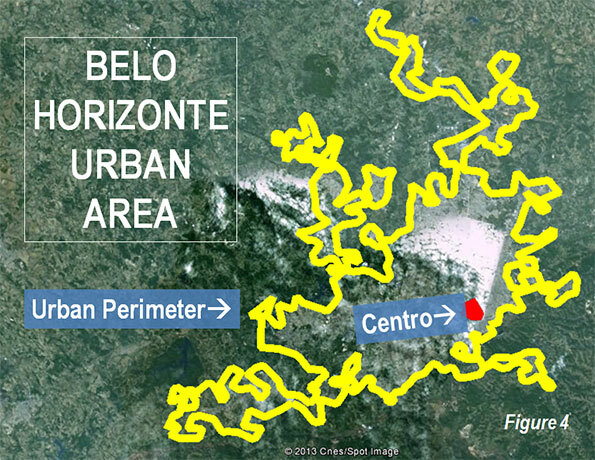 Belo Horizonte represents both the best and worst in urban planning. The core has, at least from map inspection, a pleasing street layout. In a flair that outdid L’Enfant’s Washington diagonals, Belo Horizonte Centro has a grid of streets on which is superimposed a grid of diagonals. Of course, the resulting eight street intersections make traffic more of a difficulty than with the four that are usual or the grade separations of Brasilia. Centro has a number of wide boulevards, many with green, treed medians and, in the Brazilian style, some with four roadways --- center express lanes and outside local lanes. These “three median” streets, give a pleasing feeling. The overall result is an impression similar to that of Barcelona, and a particularly attractive core that would do most European cities proud. Street patterns from space provide no indication of urban planning's effectiveness, nor of urban policy of which planning is a part. Planning is a means, not the end of cities. Over the past two centuries, billions of people have moved to cities. They did not move for the fountains, architecture, or museums (otherwise they would all live in the ville de Paris or Manhattan). In short, urban planning principles of any era have had little impact in the growth of cities. Urban planning's current "top-down" genre is rather new. Until the British Town and Country Planning Act of 1947 and similar measures, planners contented themselves to design street networks (which the Sustainable Cities Coalition highlights so well) and other necessary infrastructure, such as water and sewer networks. Their handiwork is obvious in the 19th century designed street grid of Manhattan, the straight streets of Phoenix and the modified grid of the Toronto metropolitan area. These are the broad functions emphasized by New York University Professor Shlomo Angel in his Planet of Cities. Now, urban planning can work against the very justification of cities, the prosperity of its residents. The success of urban policy (and urban planning) can be judged by how well the purpose of the city is served – the reason people moved there in the first place. The purpose of the city was well articulated by former World Bank principal planner Alain Bertaud: Large labor markets are the only raison d’être of large cities. Cities are much more about economics than aesthetics. (See end note on Sustainability). The successful city will facilitate greater affluence – higher discretionary incomes – among its residents. Regrettably, there are notable failures in this regard. For example, the urban containment policies of smart growth, which ration land and raise the price of housing relative to incomes, have been adopted in cities from Sydney to Toronto and Portland. As a result, residents have less money to spend after taxes and paying for necessities and are less affluent than they would be without such policies. In his introduction to the 9th Annual Demographia Housing Affordability Survey, New Zealand's Deputy Prime Minister Bill English pointed out that higher house prices that occur when land is "made artificially scarce by regulation that locks up land for development." Another problem is evident in excessive traffic congestion and slower travel times. Getting around town quickly contributes to greater economic growth and discretionary incomes. Public policy must facilitate mobility throughout the urban area. The mode --- the means --- is not important, the access is. Transit services are appropriate where time competitive with the automobile, such as to the largest downtowns (See Transit Legacy Cities). However, because of its unparalleled ability to provide rapid mobility throughout the urban area, public policy must also ensure a minimum of traffic congestion and effective access by cars and commercial trucks. The evidence is clear that the higher densities preferred by modern urban planning impede rapid mobility throughout the urban area (see Urban Travel and Urban Population Density). The "beauty of urban planning" is reliably appreciated from the ground, not from space. The test is how well people live, not what the city looks like. The subject is people, not architecture or urban form (see Toward More Prosperous Cities: A Framing Essay on Urban Policy, Planning, Transport and the Dimensions of Sustainability). Note on La Plata: La Plata is in the Buenos Aires metropolitan area, approximately 35 miles (60 kilometers) south of Centro in Buenos Aires. However, it is a separate urban area because of a comparatively break in the continuous urbanization between La Plata and Buenos Aires. Buenos Aires province is by far the nation's largest provincial level jurisdiction, with a population five times as great as the city of Buenos Aires. Much of the population is concentrated near the city of Buenos Aires, with which it forms one of the world's megacities. The Buenos Aires also has the largest land area and would rank 6th if it were in the United States (nearly as large as New Mexico). Note on Sustainability: Urban policies that would artificially constrain urban expansion (such as with urban growth boundaries) and discourage automobile travel have often been cited as principal strategies for reducing greenhouse gas emissions. However, important reports indicate little potential for greenhouse gas reductions from these policies, with the overwhelming share resulting from improved fuel economy. Moreover, recent research in England suggested that such policies should not "automatically be associated with the preferred growth strategy" (see Questioning the Messianic Conception of Smart Growth). Submitted by CrystalField on Sat, 06/22/2013 - 02:40. Seems to be an over populated place,well must say place is really very beautiful with an impressive street designs.